Desmond Elliot directed “In the Cupboard”, it follows six siblings born into the aristocratic De Souza family: a name synonymous with wealth. When they lose their father, they re-unite from different parts of the world and secrets that threaten to ruin the family are revealed. He also directed “Kamara Tree” where a family of extremely diverse characters gather in Freetown, Sierra Leone, to celebrate the wedding of their eccentric sister. Secrets and uninvited guests threaten the day and the family is thrown into a chaos. All these films do not just share the same director with “Baby Shower”; the stories are all the same only that the scenarios are different. 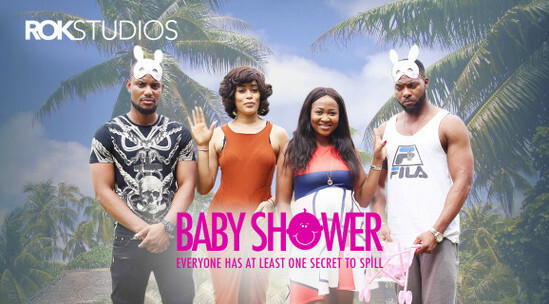 In “Baby Shower” a family gathers to celebrate the baby shower of their sister, Funmi (Mary Remmy- Njoku) who is expecting her first child. The family gathering seems like the perfect opportunity to catch up, enjoy a good party only that it turns out to be a gathering where secrets are revealed and the family is threatened by its own intention to find something to celebrate. Baby Shower like the other two follows the same pattern; the difference is that these actors are different. More than 30 minutes into the film, we are given similar scenes over and over, maybe because there’s nothing to do with the first minutes of the film or maybe, the writer has an intention we know nothing about. We watch everybody arrive, the writer tries to make the individual arrivals very interesting and humorous but this fails, instead, it drags for a long time and we only hope for it to come to an end and when it does, the second half of the film concentrates on exposing the family as dysfunctional. Similar secrets like those revealed in “Kamara’s Tree” and “In a Cupboard” is revealed. What is fascinating is not the lack of originality or creativity with these stories, it is that the same director continues to go behind the camera to deliver similar films with different actors but the same script and he finds this satisfying. “Baby Shower” tries humour but it fails, it tries to give us something different from what we have seen in the other films but it remains similar. Alex Ekubo who featured in “In the Cupboard” along with Biola Williams returns to play very similar characters to the ones they played before. The problem here is Alex, constantly taking the ‘fine boy’ roles with no purpose but to chase after girls and as an actor he finds this okay. No challenge, no rejection of being type-cast he just continues as the same person in every other film. Everybody has secrets, secrets should come to light in creative ways, it doesn’t necessarily have to be at a family gathering, where everyone has converged because of the death, birth or marriage of one member of the family. There are many ways to expose a family’s dirt, this same story pattern has been played and it is tired. We need something fresh, something different and at the end of “Baby Shower” instead of learning a lesson or two as the writer wants it; we cannot take our head out of the fact that we have watched the same story severally, just with a different cast and a different name.